The mystery begins when a barge and tug appear one morning, seemingly abandoned, at a remote shipyard on a South Louisiana bayou. Oddly, there are three national flags on board, but its owner and crew have vanished. 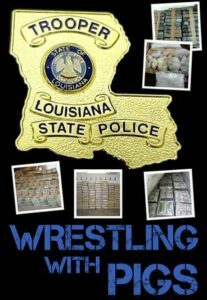 The suspense builds when Louisiana State Police narcotics agents find fifteen tons of oil and water soaked marijuana in the hold. They quickly learn it is just the damaged dregs of the single largest importation of drugs in the history of the United States. Wrestling with Pigs is a novel about smugglers, cops and corruption on the Cajun coast. Based on a real event, this authentic ‘I was there’ story provides humorous, and sometimes graphic insighst into police life complete with complex and flawed characters. It gives a gritty, and in-the-trenches look at the lucrative Central American-originating drug smuggling operations of the 80’s and how U.S. law enforcement struggled to combat it. Political insights revealed may just change the reader’s perception of organizational leadership inside police agencies and their bureaucracies.